…a marketing technique of creating and distributing valuable, relevant and consistent content to attract and acquire a clearly defined audience — with the objective of driving profitable customer action. While it is clearly one of the hottest areas of marketing right now, the practice is older than you think. In fact, if you look back through history, you will find that some of the oldest known examples are ones that we still recognize today. This magazine was published as a resource for farmers, with the idea that John Deere could teach farmers how to be more successful. Over time, The Furrow has morphed into a completely different entity. Once a 10×13 inch newspaper, today the magazine has become more visual and now thrives in a digital format. 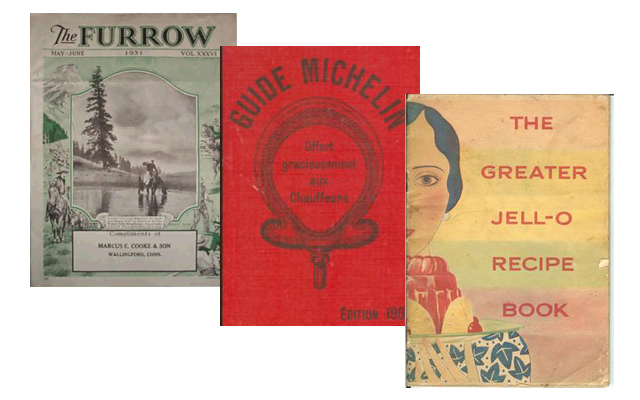 Perhaps the most well-known historical content piece, The Michelin Guides were a series of books published by the tire company over a century ago. The first guide was published in France and was intended to provide useful information for motorists, and included maps, information on car repairs, and locations of hotels and gas stations. In the years that followed Michelin introduced several more guides covering different areas of Europe. The modern version came to be in the mid-1920’s, when the company began rating restaurants with their now-famous star system. The restaurant-focused format first debuted in the United States in late 2005. Today, The Michelin Guides covers food, travel and lifestyle; foodies around the world seek the coveted Michelin star restaurants, with little knowledge of the rating’s relationship to tires. Though the gelatin dessert has been noted as far back as the 15th century, it became more mainstream in the mid-1800’s when inventory Peter Cooper found a way to make gelatin more accessible for which he was granted a patent (US Patent 4084) for a gelatin dessert powder which he named “Portable Gelatin.” Cooper did not market his product widely, but eventually a married couple transformed the tasteless powder into the fruity dessert we know today. When the couple eventually sold the patent, name and formula to their neighbor, Frank Woodward, the real business of the Jell-O brand was born. Woodward began to promote the product through an ad in the Ladies Home Journal, and sales skyrocketed. Moreover, Woodward began publishing free recipe books to teach housewives how to prepare the Jell-O. Clearly Woodward’s efforts were a success and the brand has since ascended to become one of the most well-known in U.S. history. For a more early examples of content marketing and a look at how this content has evolved over time, check out the infographic, A Brief History of Content Marketing, via The Content Marketing Institute.